The GPS-Prot visualization platform by the HARC Center at UCSF uses TouchGraph Navigator to display display HIV-Host interactions or the Human interactome. Melanie Bennett Brewer and Marie Fahey worked with TouchGraph to develop GPS-Prot GPSProt.org, a web based tool that groups proteins into functional modules or protein complexes, generating more intuitive network representations and also allows for the uploading of user-generated data. 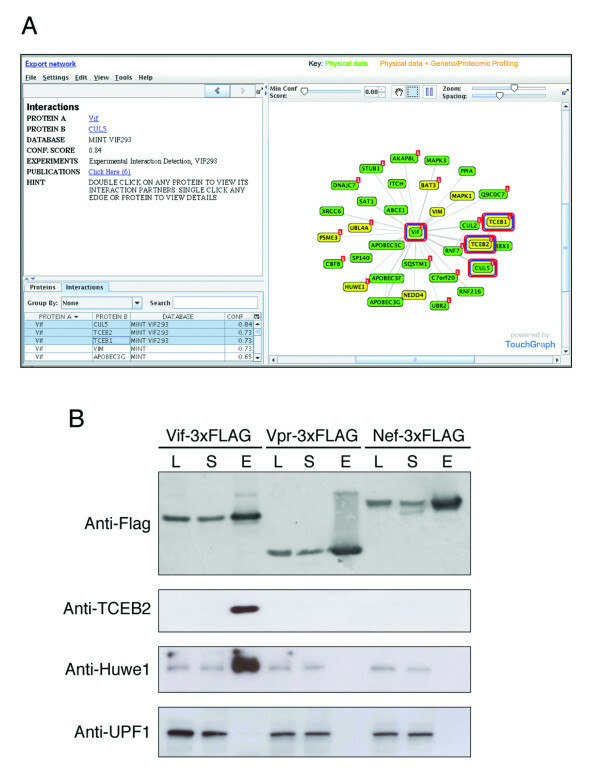 A published article in BMC Bioinformatics provides more information about this application. New York Times article by Peter Wayner features the TouchGraph Facebook visualization, along with other tools for "Illustrating Your Life in Graphs and Charts". Mr. Wayner talks about how TouchGraph Facebook was used by a music d.j. to keep track of who is coming to his shows and to identify new, untapped segments of this audience that are not connected to his existing crowd. You can add the TouchGraph Facebook Application to display your own social network. Visualization of Twitter activity of data from popular social networking tool Hashable. Hashable did a big push for their "business card replacement" application at the SxSW Festival in Austin Texas. The Hashable iPhone application sends out a Tweet whenever two users meet each other. These tweets use the #justmet hashtag and mention the @names of the people who met. 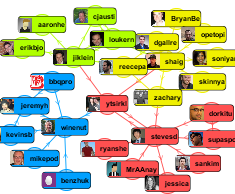 By collecting this information TouchGraph has reconstructed a visualization of who-met-who at SxSW. Double click names in the graph or the tables to browse around! It is the successor to our popular TouchGraph Google Browser. With TouchGraph SEO we are looking to incorporate additional data to facilitate both discovery and positioning of web search results. See our analysis of TouchGraph SEO of the Insurance Industry. 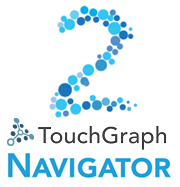 Announcing an updated version of TouchGraph Navigator 2.2! Added JPG image export format. Flexible graph filter settings for fine grained control over what's visible. New APIs for connecting to Databases, Google data feeds, and more. Improved image and data exporting. Screen by screen context sensitive help manual. network of political parties and corporate donors has been published in Die Zeit by Dr. Frank D. Behrend of Eliqos. Dr. Behrend used TouchGraph's upcoming Navigator 2 release to create a visualization of how companies such as BMW, Deutsche Bank, and Allianz contributed to Germany's six major political parties. An English version of the article is available via Google-translate. 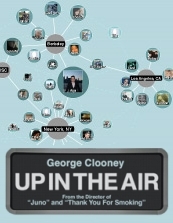 The interactive marketing team at Paramount wanted to promote Up in the Air on Facebook. The tagline for the movie is "The story of a man ready to make a connection". Paramount felt network visualization was a good way to engage fans with this metaphore. Paramount requested that TouchGraph customize the TouchGraph Facebook application to match the look of the movie website. 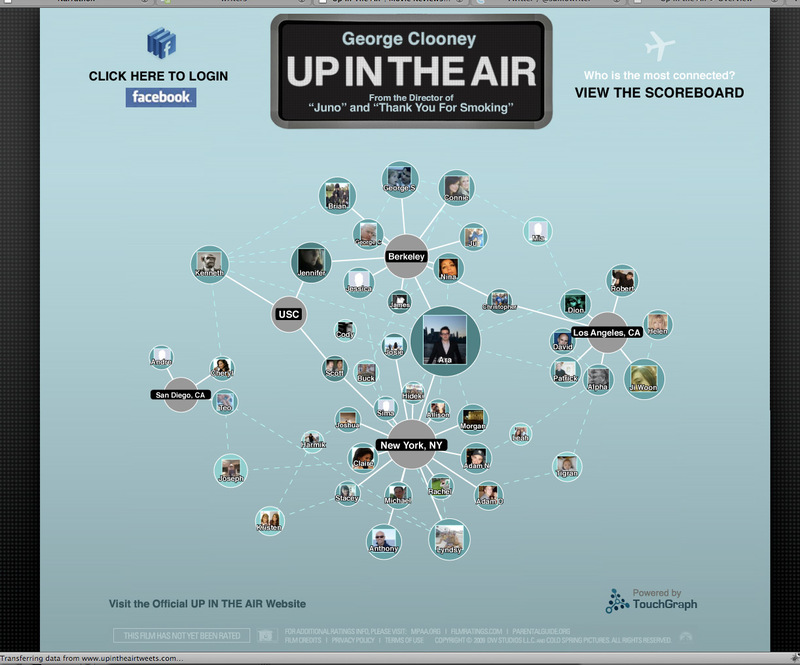 The adjacent image shows the customized look and feel from TouchGraph's proposal. 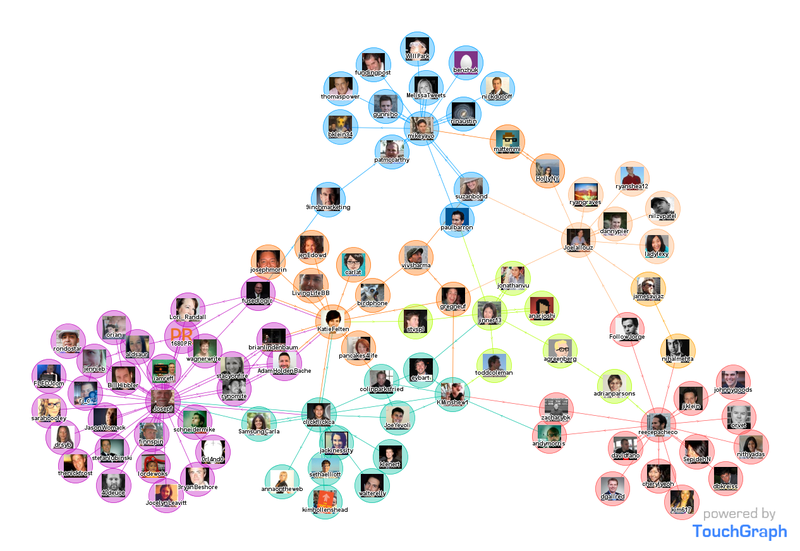 TouchGraph partners with the authors of CONNECTED: The Surprising Power of Our Social Networks and How They Shape Our Lives to create a custom version of our popular TouchGraph Facebook Photos application. Renowned scientists Nicholas A. Christakis and James H. Fowler present compelling evidence for our profound influence on one another's tastes, health, wealth, happiness, beliefs, even weight, as they explain how social networks form and how they operate. 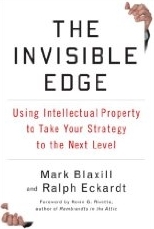 The Invisible Edge by Mark Blaxill and Ralph Eckardt talks about Intellectual Property as a priority for business strategy. The authors describe how they used tools developed by TouchGraph to zoom through IP Networks. "The picture below compares the innovation keiretsus of Toyota and Ford. The networks show the joint ownership of patents held by each company. One look and it is easy to see what was once invisible. Toyota has developed a rich network of collaborative innovation by sharing the ownership of the property rights that result. Ford? Not so much. That difference has led to dramatic differences in the performance of the two companies." Senator Arlen Specter's switch makes sense when visualized with TouchGraph Navigator. TouchGraph's visualization of senator co-sponsorship patterns in the 110th congress shows that he has acting like a democrat for years. Senator Specter has co-sponsored more bills with senators Shumer, Casey, Lehey and 7 other Democratic senators than he has with senator Coleman, his closest Republican co-sponsor. TouchGraph Navigator's senate visualization builds on James Fowler's earlier work at UC Davis.